My mother moved into Magnolia Grand, it's been great, she likes it, and they've been very cooperative. I can see myself in there one day. The people are friendly, the staff is professional, friendly, and I've seen my mom become more active and involved. The dining room is very nice, the meals seemed nice, and she didn't complain about it. Her 1-bedroom apartment is very nice, roomy enough, she has a lot of stuff that she wants with her, and she's pretty happy with the furniture she has. Magnolia Grand is great, and the people are nice, but it's kind of expensive. My uncles moved in at the end of January. They help with reminding them about medications and having dinner. There's not a big variety for the food, but it's good. They have a very spacious one-bedroom apartment, with a pretty big living room and a big area for seating. The kitchen is small, but they don't cook in there so it's perfect. The bathroom is a really good size, too. They have games. The cost is the only downfall, but it's a really beautiful facility and the people who work there really care. The staff is great and helpful, and my uncles love them. Magnolia Grand was a very nice facility. I saw the room and it was a five. The physical environment was very nice. The staff was very nice. They had a very nice dining area. It's very clean and looked like a hotel. I even got a thank you card afterward from the staff member whog gave me a tour. She was very professional and very knowledgeable. The price was high, but you could look at it and tell why it was high. Magnolia Grand is where my sister is living in independent care, except that she has meals every day, and they take her once a week where she needs to go. The people are nice, and it is very clean. She lives in a studio that is clean, nice, and just right for one person. They take them to the stores and events. They walk and have get-togethers. They have a visiting room, a game room, and all kinds of exercise equipments; the activity level is very high. The price is a little too high. Magnolia Grand was very nice and pretty. The rooms were nice and everything seemed beautiful. The food seemed good. We considered it, but we went to a place that is a little closer to our house. The staff was very nice. The apartments were clean and pretty but a little small. We went to Magnolia Grand. As far as the executive director or the assistant there, I don’t know if I have met a nicer person. That lady followed up, she was extremely sweet, and she took all of her time. I was really happy with her. She sent us a personal thank you card. I felt that if it was assisted living, it would have been great, but we found out that it wasn’t assisted living. This place has arts and crafts, brain activities, a crocheting club, and an onsite salon. The place was nice and very friendly. The director was very thoughtful. Magnolia Grand looked very inviting and had a very nice common area. It was only two stories and cost too much money. The eating facility looked nice. You get what you pay for there. They had a very nice outdoor walking area where you could walk on the facility grounds. I spoke to the main lady at Magnolia Grand, who was accommodating and very nice. The front entryway was very beautiful. Everyone appeared happy there. They had activities, but I didn’t see them. It’s been six months since my father moved into Magnolia Grand. The place is wonderful. They take good care of them. The food is very good, and my dad is very happy. He is very lucky that he got a one-bedroom unit that has not been updated, so it’s a bit cheaper than most of the others. The room is very nice, and we are very pleased. I visited Magnolia Grand for my sister, and it was very nice. The staff was very nice and helpful and called me a few times to see if there was anything they could do. It was senior living. They had libraries, game room, gym, and hair salon. We visited Magnolia Grand for my mother, but it was not suitable for her requirements, although it was a very nice place. The environment was wonderful, the people were happy, and it was a nice place, but it was an independent living facility only and didn't have a life progression program. The staff was very wonderful, nice, helpful, and informative. The residents had a great energy, and it was clearly a caring atmosphere. The grounds were limited and didn't have an outdoor place. The location was appropriate for anyone who needs access to the city center for doctors' visits and that kind of thing. The senior living place that I really liked was Magnolia Grand. It is very clean, and everybody that I met was nice, friendly, and happy. I didn’t see any obvious problems. I absolutely recommend this community. It is clean, presentable, and friendly. The most beautiful facility we toured. Nice staff and programs. Accepts pets. The views out the window were not what my mother was looking for. Magnolia Village was where my mother was at one point. It was very clean. The people were very caring. My mother did not like it when we walked in the long hall way. She felt very closed in, so she wanted something that when she went out the door, she was outside because she could get claustrophobic really easy. It was Magnolia Village we visited. They were getting ready to do a remodel. My father-in-law needed too much care to be there. Our visit was good. My dad is moving to Magnolia Village, and it appears to be very neat. It’s been there 29 years, and they're going through a complete renovation. They’re re-doing each apartment, and they’re beautiful. The staff has been there a long time, and there’s not a lot of turnover. They seem to have a lot of very active people. The food is really good. We’re looking for him to have a very nice social time there; the place seems to be very social. They play cards every day and have a movie in an actual theater. They have shuffle-board, lawn bowling, and a lot of different things that he can really do actively. I’m at Magnolia Village. It’s a lovely place. They have a great staff. The only problem is they raised their rent quite considerably, and that’s why I was thinking of leaving, but I worked that out. Otherwise, they are wonderful people. They have a lot of activities here. They have a resident council of which I am president, and I can’t say enough about them. They’re very, very good. I would definitely recommend them very highly to anyone who needs this kind of facility and can pay the rent. We were able to visit Magnolia Village when we were searching for a facility for my cousin. The place was very nice and welcoming. We have been very pleased with the place. The rooms were very large and very clean. It was very nicely maintained. Their dining room is very clean and very organized. My mom just signed a lease with Magnolia Village. My mom hasn?t moved in yet. They're in the middle of a remodel, so it's all getting refurbished. One of the things that impressed me was the fact that the old section, the part they're remodeling, was actually very well-maintained. You could tell that even though it was older, they had kept up with the little things as they went along. It was a good thing, and it was very clean. We had lunch there; the food was very good. They provide three meals a day, open restaurant sitting kind of thing. They have two entrees, and then there's a list of eight things you can always order if you don't want any of the entrees. It's like a 2-hour window for breakfast, for lunch, and for dinner, which was very nice. They do your housekeeping. You have to do your own laundry, which is fine. My mom can do that. They don't provide caretaker assistance, but they do have a contract with a care provider, and they'd had that same agency for 10 years and almost all of the people there have been there for five to eight to 10 years. Very low staff turnover. We went to Magnolia Senior Retirement Center but they were not assisted and we're definitely needed assisted living. The visit went very well though. Of all the facilities I've visited, this one is the closest to my house. They have a dining room and it was fine. Their rooms were small. The staff were very nice and courteous. I would have no problem recommending that facility. Very clean, dedicated and caring staff and excellent food. Lots of entertaining activities for residents. Very comfortable venue. Describe the overall population of independent living residents at Magnolia Grand. What is their average age? What are their favorite things to do? We cater to the young at heart, those who can't or don't want to cook and clean anymore. If safety at home is becoming an issue and socialization is missing, we are a great option. We offer an easier transition into community life when coming straight from a senior's own home. Our average age is mid 70's, but we accept as young as 55. We currently have several residents in their 50's. Within 3 miles is a huge mall and every restaurant you can think of as well as great museums and theatre performance experiences available as well within 4 miles. Riverside offers many festivals and fun events for the community and we go to most of them in our bus. What are some recent off-site events that the community activity director at Magnolia Grand has organized? We do a monthly casino outing as well as winery tours, museum trips. Recently, our residents went to a quilting and sewing EXPO at Pomona Fair Grounds. We provide a weekly schedule for doctor's appointments, shopping as well as entertaining outings for movie matinees. What transportation services does Magnolia Grand offer to independent living residents? We have a full weekly schedule to doctor's, errands, shopping and entertainment. What makes the chef or dining program at Magnolia Grand exceptional? What kind of menu can independent living residents expect? We offer three main meal times with two meal choices each along with an extensive Anytime menu that is offered anytime from 7:30am to 6pm. We offer an abundance of choices for our residents so they never feel stuck with any particular thing. We have a beautiful, newly renovated building that is clean and extremely well maintained. We proudly offer a living room area for conversations, reading the headlines and the like. We also have a beautiful bistro stocked with fresh fruit, infused water and coffee daily. Our Theatre room is a great place to catch our Netflix movies or Gospel Hour along with fresh popcorn. Next door, you find our activities room where we do group activities like adult coloring, crafts, card making and more. Wanna get in some cardio? We offer a beautiful fitness room with many machines across from our lovely dining room. For avid readers, we have an amazing library that gives the best environment possible to get lost in the written word. What safety features or security measures does Magnolia Grand offer to independent living residents? Security cameras are located inside and out in common areas. All of our outer doors are locked after 6pm, however, residents have 24 hour access. If Magnolia Grand accepts dogs or cats, what indoor/outdoor areas can they enjoy? We accept pets up to 25 pounds. There is a one time fee for pets and a maximum number per apartment. Does Magnolia Grand work with an agency or registry to provide nursing and medical assistance as needed? We have independent care companies that operate within our community which benefits our residents because they can choose the company they are comfortable with at a rate that is comfortable for them. Magnolia Grand has been described as living in a five-star resort with a big family. Here, we understand that home is something different to everyone. For some it's a comfortable place to rest and unwind after a long day of activities, socializing or traveling to wine country. For others it's a quiet retreat where you can enjoy the company of a friend or the serenity of a private apartment. Magnolia Grand, adjacent to California Baptist University, is just minutes from several major shopping areas, two hospitals, a senior citizen center, as well as the Pacific Ocean, mountains, desert and wine country. But travel isn’t always necessary because the opportunities for socializing, exercise, happy hour, learning, dancing, watching a movie or simply relaxing are virtually endless right here. Magnolia Grand was designed inside and out to nurture and stimulate the senses and foster a sense of independence. From our convenient location just off the 91 freeway, to the pet-friendly environment, we feature a comprehensive list of amenities. Call today to learn more! 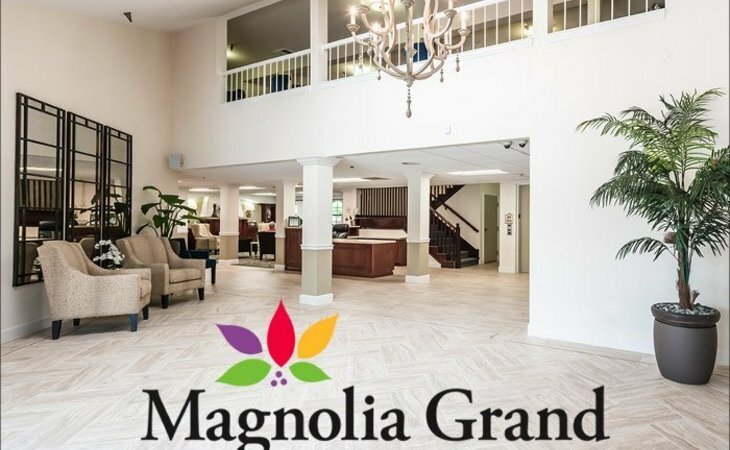 What should caregivers and potential residents know about Magnolia Grand?